Ultra-GullyGuard is a permeable device that is installed across ditches and gullies where runoff and water is channeled. The device checks the water flow and traps sediment and/or oil depending on the model used. Keep sediment and oils from contaminating downstream aquatic environments. to maintain position during heavy rainfall. Part # 9711-SED Sediment Only Model, 7" diameter x 7' L' Weight: 25 lbs. Use optional connector (Part# 9713) for applications that require longer GullyGuards. Other stock sizes and custom sizes available. Ultra-SiltFence is conveniently shipped in pre-assembled 100 foot lengths. Includes 2" square, sharpened, hardwood stakes with 5 staples to hold the silt-controlling polypropylene material firmly in place. Easy and economical way to meet erosion and sediment control requirements at construction sites. Standard heights of 24" and 36" meet many state Department of Transportation requirements. Helps comply with NPDES, 40 CFR 122.26 (1999) when used as a Best Management Practice in Storm Water Pollution Prevention Plans. 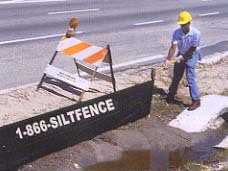 Part # 9716-WS Ultra-SiltFence, 36" H x 100' L Weight: 40bs.